After the 1662 Act of Uniformity and what became known as the Great Ejection, the ministers who were ejected from their livings played a crucial role in the development of nonconformity over the decade that followed. One of the reasons for their effectiveness was their mobility. They were prepared to travel to other parishes, to other counties, and even further afield, in order to keep alive the flame of their idea of godly worship. Mobility was also an essential feature of life for nonconformist congregations, particularly as their gatherings were not only socially risky but also illegal. Their need for fellowship led to the emergence of centres of gravity. Many of these places were, unsurprisingly, larger centres of population, but there were also some smaller towns and villages that emerged as important concentrations of nonconformist activity. There were a range of reasons for these developments. In some places it was the presence of a particularly charismatic preacher, in others it was the dynamic organisation of a prominent lay person, and in some it was the absence of a replacement conforming minister after the Great Ejection. The evidence from three counties – Warwickshire, Wiltshire, and Worcestershire - shows that the ejected ministers played a prominent role in most of these places. This post highlights three such places. 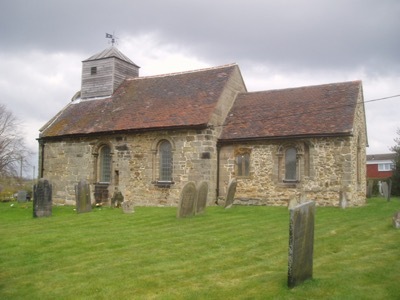 The most remarkable example of nonconformist activity in a small parish was Horningsham in Wiltshire, which is now part of the Longleat estate. The 1669 Episcopal Returns record eight ejected ministers preaching at conventicles. This is more than any other parish in the three counties and the number of attenders at conventicles reported in 1669 is the second largest after Coventry. The preachers were two ministers ejected from East Knoyle in Wiltshire, as well as ministers ejected from parishes in Dorset, Gloucestershire, Somerset, Glamorgan, and London. The popularity of this location is likely to be because of a well-connected member of the laity. The conventicles took place in a barn that was made available by Alexander Cray, a clothier, who also attended the meetings along with other members of his family, Jeremiah and William. The Salisbury court records include ‘Acts against Alexander Cray for not attending church, Horningsham, 1669’ (endnote 1). Alexander is described as a gentleman in the 1669 Episcopal Returns (endnote 2). It is possible that the Crays were a landowning family as a Jeremiah Cray purchased Reddish Farm in Broad Chalke in Wiltshire in 1696 (endnote 3). Donald Spaeth’s story of this conventicle gives a leadership role to Alexander Cray (endnote 4). One other reason for the number of ejected ministers from other counties coming to preach in Horningsham is that the village lies near the borders between Wiltshire and both Somerset and Dorset. 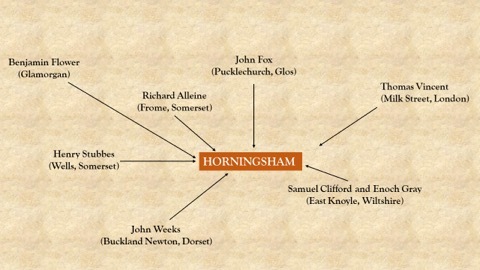 Chart 1: Ejected Ministers preaching in Horningsham 1662-1672. Chart by the author. Dissenting activity at this level could make life difficult for the local conforming clergy. In Horningsham, the attempts of the curate William Meaden to enforce conformity involved battles not only with the dissenters but also his own churchwardens, who Spaeth describes as inclined towards dissent (endnote 5). The local importance of Cray, together with the size of the nonconformist community and the involvement of the parish churchwardens, gave the conventicle confidence to take a bold step. When Meaden was away preaching in another parish, the conventicle would sometimes move into the parish church. One of these events was the nonconformist marriage of Alexander Cray’s daughter. Eventually the churchwardens turned on Meaden and attempted to have him ejected by presenting him for ‘blasting his reputation by his scandalous conversacon, & alienating the affections of (almost all) the parishioners’ (endnote 6). The parish was a fundamental part of the identity of the Church of England so, for those who rejected that Church, the strength of the parish to define their identity was weakened. Margaret Spufford argues that, because numbers in individual parishes were small, nonconformists formed new groups of ‘like-thinking people’ that ‘cut across the boundaries of parish and village’ (endnote 7). In Shuttington in North Warwickshire, the 1669 Returns report that ‘All ye resorters to it are from Newton Regis’ which is two miles away (endnote 8). Shuttington also provides evidence that a considerable delay in replacing an ejected minister could prove a catalyst in the gathering of a nonconformist conventicle. This vacuum removed the possibility of conflict with new conforming clergy and also offered the potential of an empty church building. In 1669 a successor had still not been appointed to the Shuttington living since Thomas Hill’s ejection in 1662 and conventicles were held ‘in the parish church, there being noe minister residing upon it’. This opportunity drew ejected ministers from near and far. The 1669 Episcopal Returns record preaching by ejected ministers from Tatenhall in Staffordshire, Stoke Prior in Worcestershire, as well as Thomas Hill himself (endnote 9). Some Church of England ministers were tolerant of nonconformists and even conventicles in their parishes, but for others this was unendurable. In Ramsbury in Wiltshire, an ejected minister, Henry Dent, was ‘much harassed for his Nonconformity as any minister in the county’ and that ‘three neighbouring clergymen were his bitter enemies’, including the incumbent minister, John Wilson. Wilson appears to have been a passionate supporter of the official policy towards dissent. Edmund Calamy relates an incident when Wilson’s rage drove him to a bout of frantic behaviour. Hearing that Dent was holding a conventicle at the same time as a service in the parish church, Wilson refused to begin the service until the constable and churchwardens went to disturb the conventicle. He abandoned his congregation and went with them. When they arrived they were denied entrance so they ‘broke open the doors, and found a great number of auditors, but Mr. Dent was gone’. Having lost his prey, Wilson then turned his rage on the nonconformist congregation, took their names, and imposed on-the-spot fines on some of them (endnote 10). The inconsistency of enforcement can be seen in later events in Ramsbury. The harsh treatment of Henry Dent changed when a new incumbent, Mr. Maverly, arrived in the parish. Life changed for Dent at this point as ‘he enjoyed more quiet, and had a friendly correspondence’ with Maverly. Dent reciprocated this generosity by attending Maverly’s services in the parish church with his family in the afternoon, after preaching to his own conventicle in the morning (endnote 11). These three examples of towns and villages show the impact of individual ejected ministers on nonconformist life. Taking a step back, the cumulative effect is striking. A wide range of leadership was provided for dissenting communities during this period - over the three counties for the period from 1662 to 1672, there were 207 dissenting preachers, teachers and leaders. 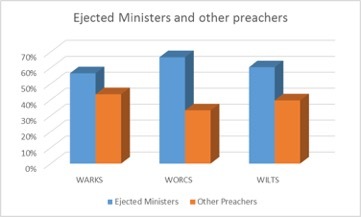 The analysis shows that sixty per cent of these people were ejected ministers from the three counties and other parts of England and Wales (see Chart 2). Chart 2: The composition of dissenting preachers 1662-72. Chart by the author. 1) Wiltshire and Swindon Archives, Dean of Salisbury Court Records, D5/21/5/13, Miscellaneous Court papers, c1560-1669. (Information from catalogue only – manuscript not examined). 2) G. Lyon Turner, Original Records of Early Non-Conformity under Persecution and Indulgence (London, 1911), p. 122. 3) Jane Freeman and Janet H Stevenson, 'Parishes: Broad Chalke' in Ed. D. A. Crowley, A History of the County of Wiltshire: Volume 13, South-West Wiltshire: Chalke and Dunworth Hundreds (London, 1987), pp. 36-52. 4) Donald A. Spaeth, The Church in an Age of Danger : Parsons and Parishioners, 1660-1740 (Cambridge, 2000), p. 168. 5) Spaeth, The Church in an Age of Danger, p. 168. 6) Quoted in Spaeth, The Church in an Age of Danger, p.168. 7) Margaret Spufford, Contrasting Communities : English Villagers in the Sixteenth and Seventeenth Centuries (London, 1974), p. 344. 8) Turner, Original Records of Early Non-Conformity under Persecution and Indulgence, p. 58. 9) Turner, Original Records of Early Non-Conformity under Persecution and Indulgence, p. 58. 10) A. G. Matthews, Calamy Revised : Being a Revision of Edmund Calamy's Account of the Ministers and Others Ejected and Silenced 1660-2 (Oxford, 1934), p. 162. 11) Matthews, Calamy Revised, p. 163. David Fletcher is a History PhD Student at the University of Warwick, researching ‘Religion and the Restoration Stage’. This post is part of the paper he gave to the 'Parishes and Migration' symposium in May 2018 entitled '”Strangers and Pilgrims on the Earth”: The mobility of nonconformist clergy after the 1662 Great Ejection'. The paper was based on research for his MA Dissertation and focused on parishes in Warwickshire, Wiltshire and Worcestershire. This post is also available in Word format.